As modern smartphones have added new features and ever increasing screen sizes, the demands on the handsets batteries have increased dramatically and can often mean some users running out of juice when they are not near a charger. We are now beginning to see more charging solutions offered in public places, and the Gidophone Qi inductive wireless charging kiosks will be on show at MWC 2013. 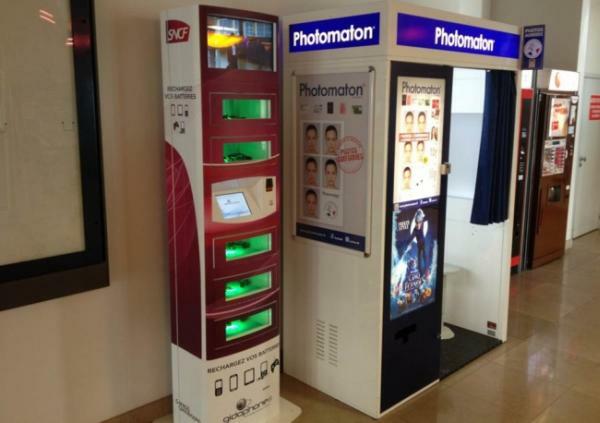 The French company called Gidophone have developed inductive charging tower kiosks that can be provided for public areas, and can offer users of smartphones, tablet PCs, cameras, MP3 players, and game consoles of all popular brands and makes a solution for when battery life is about to run dry. These charging kiosks are ideal for shopping malls, airports, fitness centers hotels, and many other public places with customer payments being accepted via credit cards, prepaid cards, and even cash. The Gidophone charging kiosks are completely secure while providing induction charging to mobile products. Users can place their device into the charging station in its own private secure compartment, which is locked by a password until it is needed again. Each compartment has twenty different connectors along with a Qi wireless charging pad, and for more information click here. Have you used a charging station like this?